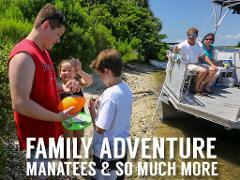 If you are visiting Florida hoping to enjoy all the water activities we have to offer, then this is the tour for you! 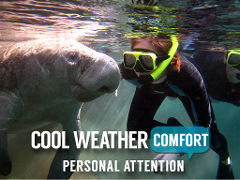 Slow cruise in the manatee zone? Check! Option to snorkel with our endangered friends? Check! Speed boating down the river taking turns on a tube? Check! Island hopping for a picnic or salt water snorkel? Check! Use your time to kayak to a spring or paddle in the Bay! Check! Laughing and bonding with your friends and family during a day filled with adventure? 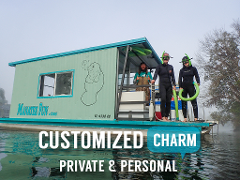 Let us customize a tour that can deliver you memories and fun for your entire family or group! Envision your ultimate day, and let River Ventures handle the details! Let the kids unplug and the adults unwind, there is something so special about spending a day together in fresh air and sunshine! 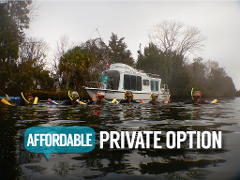 There is no other tour quite like this in Citrus County and no other tour Company does it quite like River Ventures. Have no doubt when booking, everyone in your group will have an awesome time! 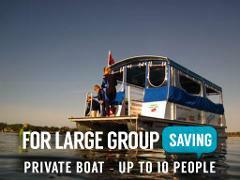 Your boat comes equipped with a one person tube, and two kayaks (singles or doubles). Let us know what your family would like to focus on, and we will deliver an awesome experience! Bottled water provided, parking and gear included in price! Please call to book within 48 hours of tour date. Remember that once the weather starts to get warm in March, manatee begin their migration away from the springs and become more elusive. It is very important in the warm seasons to have REALISTIC EXPECTATIONS about how many animals you will see, under what conditions and how long it may take to find them. The COLD weather brings them to the area to enjoy our fresh water springs, but once the Gulf temps begin to warm, the manatee become more difficult to find and tend to be located closer to food sources where the water is not always clear. Also, spring brings hundreds of people to the area hoping for a glimpse of these amazing animals…COME EARLY MORNING if you hope to avoid the crowds. We add tours later in the day as capacity demands, but conditions deteriorate as the day goes on. If you are hoping to see dozens of manatee in clear spring water, than a springtime visit may disappoint. If you need more details about what to expect when visiting us in spring or summer, please visit our conditions page or call us anytime! We are always honest about conditions and encourage our visitors to do their research!